A compliment from my DH this morning when I showed him my finished waistcoat. He said it didn't look hand made, rather bought from a shop. Bless. He was rather jaded though after a night out with the boys so perhaps beer goggles still on combined with a slight guilty conscience. I can't wait to wear it. Not quite warm enough for spring mid layers. 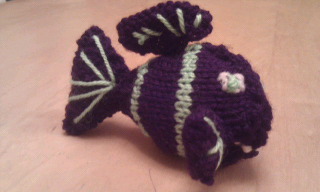 Made my darling daughter a fish from my new book. I think my colourways, dark purple and lime green, are cuter than the book's. You decide!? Have left by her bed so she gets a sweet surprise on waking. My gorgeous son will be jealous and demand his own!